Trademark right lasts for 10 years in Japan. If a registrant (trademark right owner) wishes to maintain the right for additional 10 years, the term can be renewed by filing a request for renewal. The request for renewal needs to be filed within 6 months before the end of each ten-year period after the date of registration, with payment of renewal fee. If the request is filed, the trademark right will be renewed for additional 10 years. By renewing a trademark right every 10-year period, trademark rights can be maintained as long as the registrant wishes. It must be hard for those who run a business or handle multiple tasks to keep track of every due date of your trademark portfolio. Trademark Wagon makes sure to send you reminders that notify you of the upcoming expiration date of your trademark right. Our 3rd and last reminder will be sent to you about 1 month before the expiration date. It is important that our reminder reaches you. If there are any changes in your contact details such as email address, name, address, fax number, etc., please provide us with your updated contact information so that we will be able to remind you of this important due date. Please note that Trademark Wagon provides Renewal Reminder Notification Service only to our clients for who we have handled filing or renewal of the trademark registration as a lawful representative. This is a good opportunity to check name and address. Renewal period starts 9 years and 6 months later after the date of trademark registration. In some cases registrant's name and/or address have already been changed by the time of renewal. When registrant’s name and/or address or ownership of a trademark right has been changed, the change must be promptly recorded in the Trademark Register of the Japan Patent Office, but it is often left unchanged. Renewal period is the time when you get in touch with your trademark attorney. It is a good opportunity to check registrant’s name and address. A request for renewal cannot be filed with registrant’s new name and/or address or in the name of a new owner (assignee, etc.) unless the change has been recorded with the Japan Patent Office. If there are any changes that have not been recorded, don't forget to ask your trademark attorney to record the changes. It is important that the Japan Patent Office’s records of registrant’s name or address or owner of a trademark right remain accurate. Taking this opportunity, please check your trademark right information to see if there are any changes. If there are, don't forget to ask your trademark attorney to record the change in the Trademark Register of the Japan Patent Office. Trademark Wagon has Special Renewal+ Package offers for handling your trademark right in Japan. What is a Transfer (Change in Ownership) of a Trademark Right? 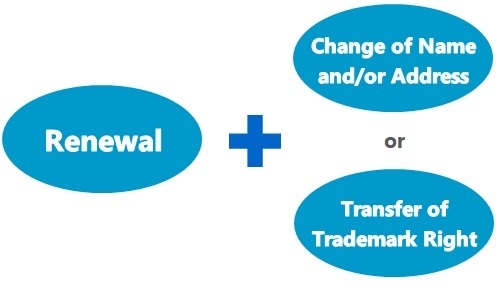 A transfer of a trademark right is the process by which ownership of a trademark right is passed from old owner (A) to new owner (B). A trademark right may be transferred for various reasons, including assignment, merger or inheritance from a deceased person. It is important to be aware that change in ownership caused by assignment will take effect only when it is recorded in the Trademark Register in Japan. Therefore, assignment should be recorded as soon as assignment agreement is concluded. If a transfer of a trademark right occurs due to merger, inheritance, or any other general succession, it will take effect immediately at the time of merger, inheritance etc. It doesn't matter whether or not a transfer is recorded in the Trademark Register of the Japan Patent Office. Nevertheless, an application to register a transfer due to general succession should be prepared and submitted without delay. Records in the Trademark Register are available not only to its owners but also to the public. In order to avoid confusion, records must be kept new and accurate. Official fees and supporting documents to be required by the Japan Patent Office for recording change in ownership of trademark right differ, depending upon the reasons etc. of an owner change.